This has easily come to be one of my favorite quick meals. Not only does it make enough for a family dinner (or for us enough for leftovers for a day or two) but it's quick and easy on a hot summer day. Combine chicken, onion, chili powder, cumin, salt and pepper in a bowl; toss well. Add oil & swirl to coat. Add chicken mixture; cook 8 minutes or until chicken is done, stirring occasionally. Add beans and garlic; cook 2 minutes or until heated, stirring frequently. Divide chicken mixture evenly among tortillas. Top each burrito with 2 tablespoons cheese. Roll up each burrito jelly-roll fashion. Coat both sides of burritos evenly with cooking spray. 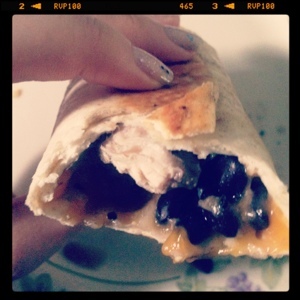 Place burritos in pan; cook 2 minutes on each side or until browned. Top with pico de gallo and sour cream.